Those with authorized Apple developer accounts can update their devices directly through the Software Update section of the built-in Settings application. Monday's launch confirms an earlier rumor that Apple planned to follow a two-week release schedule. The third beta is said to address a number of issues that previously existed when using Apple's iCloud services. Specifically, people familiar with the accompanying release notes said a number of problems associated with the new iCloud Keychain feature have been fixed in beta 3. Issues that also existed with Find My iPhone and Bookmarks toggles have reportedly been addressed. 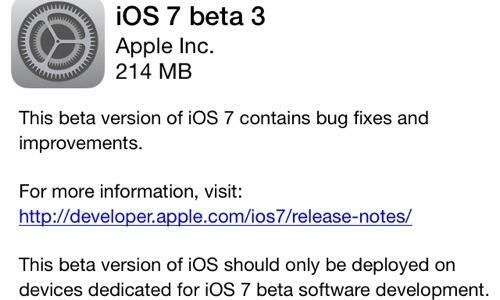 As before, has warned users that the second beta "should only be deployed on devices dedicated for iOS 7 beta software development." The prerelease software is not intended for use among the general public. The second iOS 7 beta was provided to developers two Mondays ago, on June 24. It added new voice options for Apple's Siri personal assistant software. Apple gave developers the first beta of iOS 7 a month ago at its annual Worldwide Developers Conference. That was also the first time the world, outside of Apple's team, got to see a major design overhaul for the platform.